Nominees are sent to Pushcart Press, who then chooses winners to reprint in their annual anthology. For more information on the Pushcart Prize, visit them here. Congratulations to James Valvis, winner of the 2019 Neil Postman Award for Metaphor for his poem “The Distracted.” The annual award of $1,000 is given to the poem that exhibits the best use of metaphor among all of the submissions Rattle received over the previous year. For more information, see the Postman Award page. Congratulations to Katie Bickham, winner of the 2018 Rattle Poetry Prize Readers’ Choice Award, for “The Blades.” The prize is $2,000. Subscribers voted for the winner, from ten editor-chosen finalists. To read some of what our readers said about this and the other finalist poems, click here. Nominees are sent to Pushcart Press, who then choose winners to reprint in their annual anthology. For more information on the Pushcart Prize, visit them here. For more information on the Best of the Net series, visit the Sundress Publications website. Congratulations to Dave Harris, winner of the 2018 Rattle Poetry Prize, for his poem “Turbulence.” The award is $10,000, and the poem will be published in issue #62 of Rattle in December 2018. Ten Finalists each received $200 and publication, as well as a chance to win the $2,000 Readers’ Choice Award, to be selected by subscriber vote. For more information on the winners, click here. Congratulations to Raquel Vasquez Gilliland, Nickole Brown, and Elizabeth S. Wolf, winners of the 2018 Rattle Chapbook Prize. The chapbook will be distributed to all 8,000+ subscribers along with three separate future issues of Rattle. Subscribe today to receive each of these three books over the next year! Congratulations to Rebecca Starks, winner of the 2018 Neil Postman Award for Metaphor for her poem “Open Carry.” The annual award of $1,000 is given to the poem that exhibits the best use of metaphor among all of the submissions Rattle received over the previous year. For more information, see the Postman Award page. Congratulations to Jimmy Pappas, winner of the 2017 Rattle Poetry Prize Readers’ Choice Award, for “Bobby’s Story.” The prize is $2,000. Subscribers voted for the winner, from ten editor-chosen finalists. To read some of what our readers said about this and the other finalist poems, click here. Congratulations to Rayon Lennon, winner of the 2017 Rattle Poetry Prize, for his poem “Heard.” The poem earned $10,000 and will be published in issue #58 of Rattle in December 2017. Ten Finalists each received $200 and publication, as well as a chance to win the $2,000 Readers’ Choice Award, to be selected by subscriber vote. For more information on the winners, click here. Congratulations to Taylor Mali, winner of the 2017 Rattle Chapbook Prize for The Whetting Stone. The chapbook will be distributed to all 7,500+ subscribers along with the Fall 2017 issue of Rattle. Two runners-up will also receive publication and full distribution: In America by Diana Goetsch will appear with the Winter 2017 issue, and A Bag of Hands by Mather Schneider will appear with the Spring 2018 issue. Congratulations to Kelly Grace Thomas, winner of the 2017 Neil Postman Award for Metaphor for her poem “And the Women Said.” The annual award of $1,000 is given to the poem that exhibits the best use of metaphor among all of the submissions Rattle received over the previous year. For more information, see the Postman Award page. Congratulations to Ellen Bass and David Kirby, co-winners of the 2016 Rattle Poetry Prize Readers’ Choice Award, for “This Living Hand” and “Poem Written in the Sixth Month of My Wife’s Illness,” respectively. Their poets split the $2,000 prize. Subscribers voted for the winner, from ten editor-chosen finalists. To read some of what our readers said about this and the other finalist poems, click here. “[Here, said the ocean]” by Rodrigo Dela Peña, Jr.
Congratulations to Julie Price Pinkerton, winner of the 2016 Rattle Poetry Prize, for her poem “Veins.” The poem earned her $10,000 and will be published in issue #54 of Rattle in December 2016. Ten Finalists each received $200 and publication, as well as a chance to win the $2,000 Readers’ Choice Award, to be selected by subscriber vote. For more information on the winners, click here. Congratulations to David Kirby, who won a Pushcart Prize for his poem “More Than This,” from issue #50. The poem will be reprinted in the Pushcart Prize anthology at the end of 2016. Congratulations to Zeina Hashem Beck, winner of the 2016 Rattle Chapbook Prize for 3arabi Song. The chapbook will be distributed to all 7,500+ subscribers along with an issue at the end of the year; one of the runners-up will also be distributed to each subscriber at random, so that everyone receives two chapbooks. The runners-up were: “Kill the Dogs” by Heather Bell, “Ligatures” by Denise Miller, and “Turn Left Before Morning” by April Salzano. All four chapbooks will be available for individual sale. Congratulations to Jack Vian, winner of the 2016 Neil Postman Award for Metaphor for his poem “Musashi-san.” The annual award of now $1,000 is given to the poem that exhibits the best use of metaphor among all of the submissions Rattle received over the previous year. For more information, see the Postman Award page. Congratulations to Jennifer Givhan for winning the 2015 Lascaux Prize in Poetry for her poem, “The Polar Bear,” which first appeared in Rattle’s Poets Respond series in May 2015. She earned $1,000 from the Lascaux Review. Read the poem again and find more about the Lascaux Prize at their site, here. Congratulations to Valentina Gnup, winner of the 2014 Rattle Poetry Prize Readers’ Choice Award, for “Morning at the Welfare Office.” Her poem earned her $2,000. Subscribers voted for the winner, from ten editor-chosen finalists. To read some of what our readers said about this and the other finalist poems, click here. Congratulations to Tiana Clark, winner of the 2015 Rattle Poetry Prize, for her poem “Equilibrium.” The poem earned her $10,000 and will be published in issue #50 of Rattle in December 2015. Ten Finalists each received $200 and publication, as well as a chance to win the $2,000 Readers’ Choice Award, to be selected by subscriber vote. For more information on the winners, click here. Congratulations to Hannah Gamble, winner of the 2015 Neil Postman Award for Metaphor for her poem “Biscuit.” The annual award of $500 is given to the poem that exhibits the best use of metaphor among all of the submissions Rattle received over the previous year. For more information, see the Postman Award page. Congratulations to Courtney Kampa, winner of the 2014 Rattle Poetry Prize Readers’ Choice Award, for “Poems About Grace.” Her poem earned her $1,000. Subscribers voted for the winner, from ten editor-chosen finalists. To read some of what our readers said about this and the other finalist poems, click here. Thanks to Sherman Alexie for selecting Danielle DeTiberus’s “In a Black Tank Top” from Rattle #43 for inclusion in The Best American Poetry 2015, forthcoming from Scribner in September 2015. Congratulations to Craig van Rooyen, winner of the 2014 Rattle Poetry Prize, for his poem “Waiting in Vain.” His poem earned him $5,000 and will be published in issue #46 of Rattle in December 2014. Ten Finalists each received $100 and publication, as well as a chance to win the $1,000 Readers’ Choice Award, to be selected by subscriber vote. For more information on the winners, click here. Rattle is excited to announce a new series, Poets Respond, in which poets are encouraged to write and submit new poems based on news items from the last week. A response poem will appear each Sunday, and each author will receive $25. To read poems from past week, and for information on submitting your own work, visit the Poets Respond page. Congratulations to Francesca Bell, winner of the 2014 Neil Postman Award for Metaphor for her poem “Where We Are Most Tender.” The annual award of $500 is given to the poem that exhibits the best use of metaphor among all of the submissions Rattle received over the previous year. For more information, see the Postman Award page. Rattle is excited to announce that, beginning in 2014, we will be able to pay all of our poets. Contributors to the magazine will receive $50 per poem/essay, in addition to the complimentary subscription. For information on how to submit, read our guidelines. Rattle has just released the first annual Rattle Young Poets Anthology, featuring 60 poets under the age of 16. For more information, visit the page. We have three editors, so we each just chose our favorite two poems from 2013. Nominees are sent to Pushcart Press, who then choose winners to reprint in their annual anthology. For more information on the Pushcart Prize, visit them here. Congratulations to Roberto Ascalon, winner of the 2013 Rattle Poetry Prize, for his poem “The Fire This Time.” His poem earned him $5,000 and will be published in issue #42 of Rattle in December 2013. Ten Finalists each received $100 and publication, as well as a chance to win the $1,000 Readers’ Choice Award, to be selected by subscriber vote. For more information on the winners, click here. Rattle is happy to announce a new annual anthology of poetry written by young people. The Rattle Young Poets Anthology will be a stand-alone volume of poetry written by poets ages 15 and younger, releasing in December of each year. For more information, see the Young Poets page. Congratulations to Eugenia Leigh, winner of the 2013 Neil Postman Award for Metaphor for her poem “Destination: Beautiful.” The annual award of $500 is given to the poem that exhibits the best use of metaphor among all of the submissions Rattle received over the previous year. For more information, see the Postman Award page. We have three editors, so we each just chose our favorite two poems from 2012. Nominees are sent to Pushcart Press, who then choose winners to reprint in their annual anthology. For more information on the Pushcart Prize, visit them here. 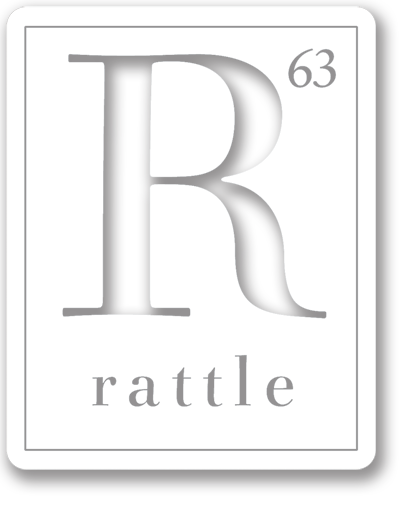 Rattle is excited to officially announced that we’ll begin quarterly publication in 2013. New, slimmer issues will appear every March, June, September, and December. Spring and Fall issues will be entirely dedicated to a theme, Summer and Winter will be open to anything. Our subscription prices will only be going up very slightly, to cover some of the extra postage, but subscribe or renew by the end of 2012 to receive quarterly issues at the biannual rates! To order, go here. Congratulations to Heidi Shuler, winner of the 2012 Rattle Poetry Prize, for her poem “The Trials of a Teenage Transvestite’s Single Mother.” Her poem earned her $5,000 and will be published in issue #38 of Rattle in December 2012. Ten Finalists each received $100 and publication, as well as a chance to win the $1,000 Readers’ Choice Award, to be selected by subscriber vote. For more information on the winners, click here. Rattle is happy to introduce a new reading series at the Flintridge Bookstore & Coffeeshop in La-Canada, CA. Join us at 5 p.m. on the first Sunday of every month for a selection of readers from the current issue. For more information, and a schedule of readers, check the Reading Series page.